A beautifully made 1.5 inch khanda poppy lapel pin. The Khanda Poppy Project was setup in 2012 to create awareness and help educate our community and children, and also the public about the immense sacrifices and contribution that the Sikhs have made to Western society, and that the turban is a symbol of protecting those freedoms. World War One and World War Two saw 83,000 Sikh soldiers killed and over 100,000 wounded fighting for the British. Following in the footsteps of Sri Guru Tegh Bahadur Ji, this immense sacrifice has made a significant impact on the history of the world as we know it now. These sacrifices were made in order to defend and protect the freedoms of people living in lands and of faiths not our own. As a community, it is right that we recognise and remember these sacrifices, and educate ourselves and our children. A TEACHER has designed a special poppy holder for Sikhs to honour soldiers from their religion who gave their lives in the First and Second World Wars. Kalwinder Singh Dhindsa felt compelled to design the Khanda poppy holder after a visit to the National Memorial Arboretum, in Alrewas, with his cousin Jaz Rai. They noticed the arboretum was selling poppies for other religions, but not one specifically to honour the 83,000 Sikhs who died in the two conflicts. Mr Dhindsa, 31, who teaches at Littleover Community School, said: “I felt it needed to be made because I want more young Sikhs and the public to be aware of the great contribution the Sikhs made during both world wars in helping the Allies fight the Nazis and fascists. “I feel that a better understanding of the role of Sikhs and their contribution during the wars might also educate those that see the turban and the beard as a threat. Mr Dhindsa’s design has a poppy mounted on the Khanda – a broadsword that is one of most important symbols of Sikhism. He approached the Royal British Legion’s poppy factory and it has agreed to produce the Khanda poppies to sell at the arboretum. Mr Dhindsa, of Breedon Avenue, Littleover, said: “The poppy enables everyone to know that these Sikhs sacrificed themselves for the greater cause. A Sikh Memorial at Alrewas is already being planned, so it would be great to have Sikh poppy Khandas to place at the base of the memorial when it is finally created and revealed. 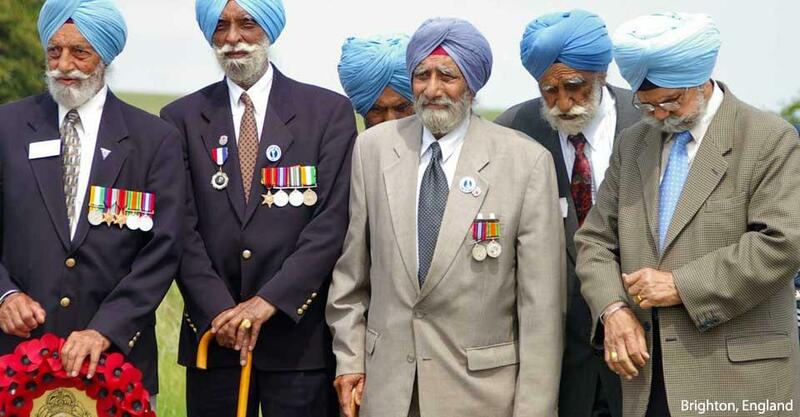 “By placing the Sikh poppy next to these names, we would also be remembering all those who sacrificed their lives in defending the truth and not only the Sikhs. Bill Kay, from the Royal British Legion’s poppy factory in Richmond, Surrey, said he was only too happy to produce the Khanda poppies. He said: “It is a brilliant idea and we are indebted to Kal for coming up with such a great design. “We already produce the Christian cross, the Star of David, the Crescent Moon for Muslims and a remembrance stick for those with no religious affiliation. Khanda Poppy ground sticks and lapel pins can be purchased in the shop area of this site. Every year, Remembrance Day is held on 11th November. We wish to encourage members of our community to purchase them and lay them at your nearest war memorial on this day along with other communities who do the same. Please use the War Memorial database search in the Resources page. We also want to encourage Gurdwaras to allocate or create a space that can be used as a memorial for sangat. Please also send us details of your events locally for inclusion on this site.